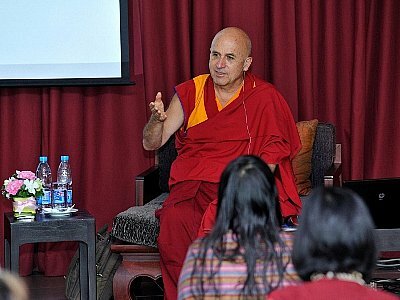 PHUKET: The Thanyapura Mind Centre (TMC) is welcoming back world-renowned academic-turned-Buddhist monk Matthieu Ricard for an exclusive visit and discussion tomorrow. Venerable Matthieu Ricard will deliver a talk entitled “Towards an education based on co-operation and the cultivation of fundamental human values”. The French-born academic left his distinguished scientific career in 1972 to concentrate on Buddhist contemplative practice. He has since lived in India, Bhutan and Nepal with some of the greatest living teachers of Buddhism. Since 1989 he has also served as French interpreter for His Holiness the Dalai Lama. A prolific author and photographer, Venerable Matthieu Ricard has published revered titles including The Monk and the Philosopher and Journey to Enlightenment (The Spirit of Tibet). Now living at Nepal’s Shechen Monastery, he is a member of the Mind and Life Institute. He is currently engaged in research on the effect ofmind training and meditation on the brain at several universities across both the US and Europe. Matthieu donates all proceeds from his work and much of his time to 30 humanitarian projects in Asia, through his work with Karuna-Shechen. Karuna-Shechen initiates and oversees projects that provide health care, education, and social services for the under-served populations of India, Nepal, and Tibet. It was founded in 2000 by Matthieu Ricard with the ideal of compassion (karuna) in action. Suggested donations by attendees are 1,800 to 2,400 baht, with all proceeds going to Karuna-Shechen. The talk starts at 6pm. For further information, contact Padmini Mangunta (Email: [email protected]; Tel: 076-336000 or 083-1734655; Web: www.thanyapura.com).